I'm lonesome in Jakarta. And I think my family are vampires. My mother's here from Jeddah; she's busy designing Umrah packages for the exhibition. My aunt Myra's here from Bali; she's busy creating boxes for the rosaries that she's gonna sell in the exhibition. My Uncle Arie doesn't work here, but when he's around, the grownups would start vehement conversations about their relatives and relatives' former spouses. 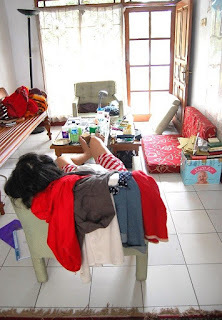 We live in the same house but follow different time zones: these loud Batak-Maduranese-descendants (as loud as their tribal ancestors) are robust with activity when it's time for me go to stuff my ears with pillows, and they are dead asleep when I have to tiptoe around the house - in broad daylight. Hence the suspicion that they're vampires. Want to know my actual contribution to the exhibition? Since the quiet manservant (mentioned here) is on sick-leave, and everyone else is busy with important causes, I'm left with the unwashed dishes and taking the trash out for a walk and preserving the house from turning into a complete shipwreck. Humbling is to realize (again and again) that, against the shiny cosmopolitan bling, I'm a just an invisible fairy from an obscure village. A nawbawdy. I suddenly realize how it feels to be an only child, an adolescent and a nobody all at the same time. I'm homesick. I miss being in Big Daddy's home, with just the two of us living there in the evenings, complementing each other so well that we rarely need to talk. I miss not being interrupted. I miss not needing my voice to validate my existence. I love my family. I just love them more when I miss them. Isn't it tragic in the presence of loved ones, it's conversing with you that I miss the most? Ever felt like a wallpaper amongst your closest kin? How did you manage not drowing yourself in booze? This post parades a tent on Carnival of Family Life, March 2009.